This little playground of mine is where reading, chin wagging, writing and a bit of wine, or beer, come gloriously together. It’s not like any other bookshop because it’s not only a bookshop. It’s like a library, a cultural center, a reader-writer paradise and a bit of a Friday night dinner party establishment, among other things. Untidy like your imagination – because let’s face it, imagination is not tidy – it has a magical way of transforming your deepest thoughts and plots into a story that you can immediately pick up and delve into. Most of the books on offer are used. They are also all in English, and you have access to more because it works on a loan basis: you buy a book and if you bring it back, you get the purchase price refunded except for € 1.50. You will probably bring it back because if you absolutely loved it you will want more. And there will be more. Ask Sophie at the desk or whisper it into the walls. The books that you’re looking for have a magical way of appearing in front of you in here. That is my personal experience. 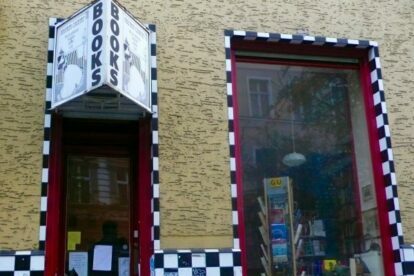 This is why it lures me back, to visit the little slovenly corners and piled-up bookshelves, to attend a few readings or workshops or chat with the owner, Sophie, who has wonderful stories of her own; of her life, of her books, of Berlin and all the fascinating people who open Another Country’s door.